I've decided on a name - "Star-crossed"
Thank you for all of you who suggested names! I'm getting even more ideas from these suggestions! I know, I'm really flaking out on these names. I don't know why, but some quilt designs just more or less "tell me" what they should be called. Others, not so much. This one - once again, I have a name I gave it on my file folder - but I don't like it. I have to describe it somehow or I'll not know what which quilt I'm talking about as I work. I name it on my EQ file (Electric Quilt) and then match that name to a computer file where I will store pictures of the work in progress and then the final top and lastly, the finished quilt (a picture that is) and pattern. By the time I made this one (I'm currently actually on top 32, BTW - this one was #27), I was feeling like my blues collection had reduced significantly, but not completely. I still had enough left of two of these fabrics to make them "constants". The two constants in this one were the dark grayish blue that I used as the "middle round" and the royal blue sashing. For the rest I used a very, very light blue - almost white as the background forming the sort of arrow/star points and then various blues for the "outer round" of the quarter log cabin. The center blocks and star points were all quite varied. 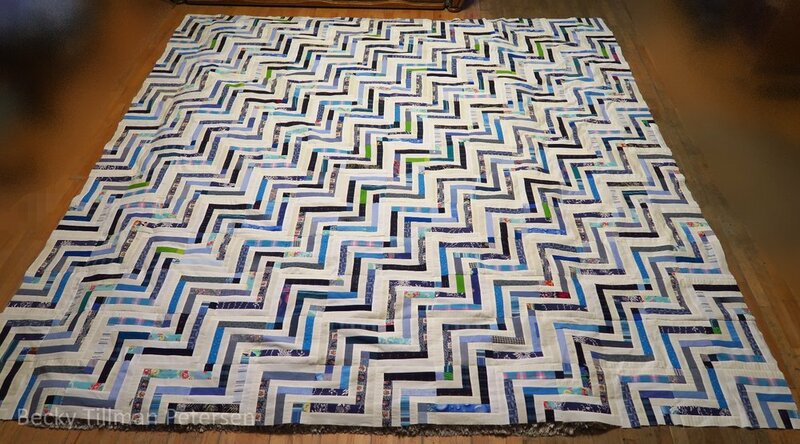 The interesting thing about this one is that I used mostly 2.5" strips and squares. At first I wanted to make those bigger blocks out of 6 2.5" squares until I talked myself right out of it. I knew i still had some larger pieces I could scrounge through and find enough to make it work. If it feels like I've been using quarter log cabins lately, I have and I haven't. 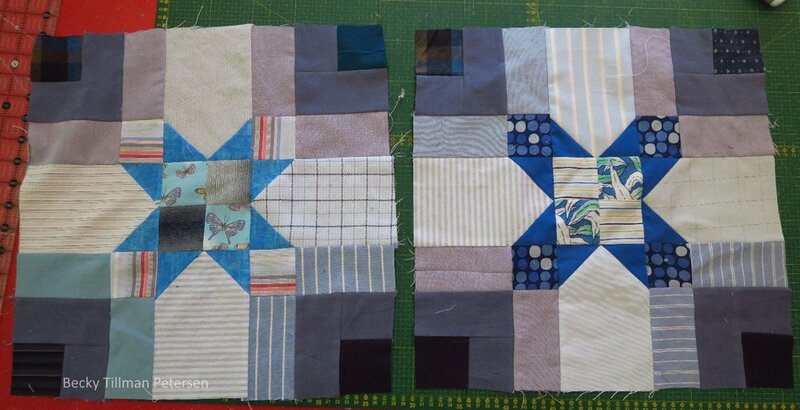 Here are some other quilts that are built on the quarter log cabin shape. I like it. I could use it several more times and not grow tired of it. I spent some time today going through my scraps - or "designated for string/crumb quilts" and pulled out some larger pieces to see if I can cut them up some more to use in other tops. I'm scuffling here, to use a baseball term - only they use it to mean that things aren't going to well - I am using it more or less to mean I'm scrounging around for pieces big enough to use for yet another top - but at some point it just isn't going to be worth it to me to keep going back through my leftovers to pick out pieces large enough to use. I'm not quite there yet, but am starting to feel that way. 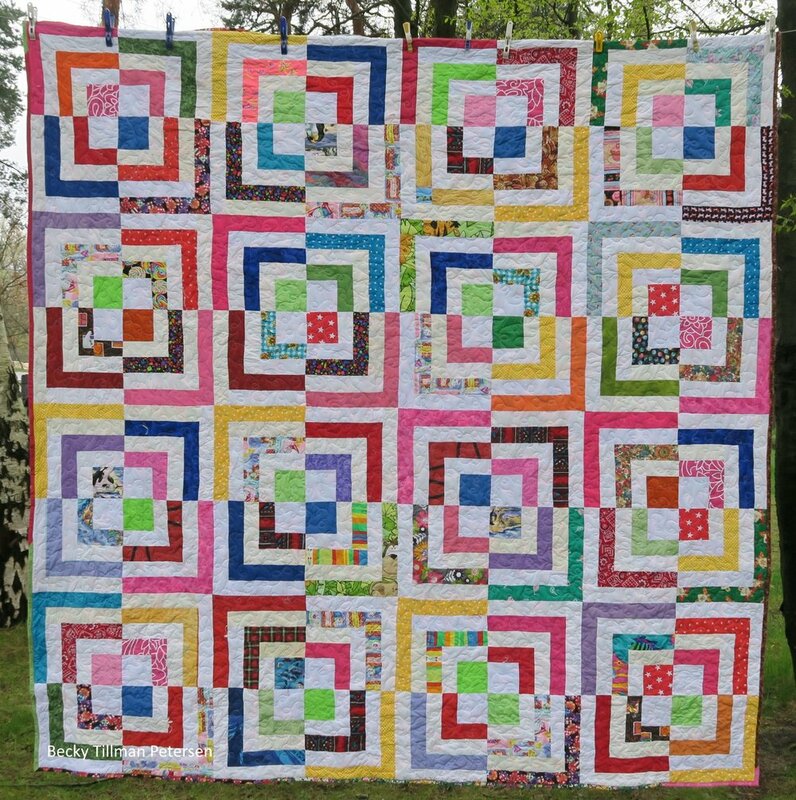 If you have a suggestion for a name, please put it belong or hop on over to the Facebook group called Quilted Twins - Scrap Quilting and More with Becky and put in your two cents worth. I hope someone has a name that speaks to me! It's for sure someone has a better idea than I have had to date! I'll be leaving this open til Monday morning as I don't want to work on this over Sunday...so you have two days to think about it. Then, on Monday I'll decide and get the pattern up! I trust you have a great day - wherever you are reading this! Don't forget to check out what my sis has to offer!